The three games fall readily into two sub-groupings – in one are the two Napoleonic offerings, on Marengo and Austerlitz, and in the other, the designer’s Gettysburg title. 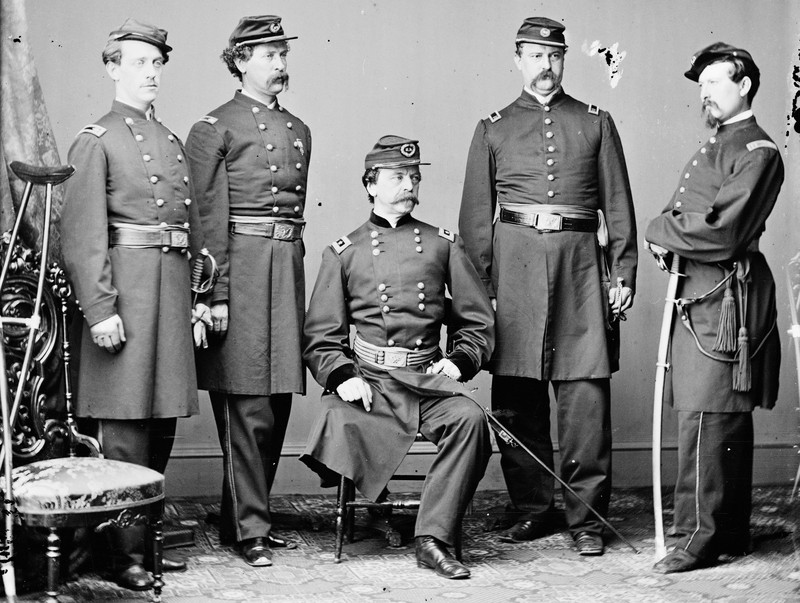 There are certainly similarities between the first pair and the Gettysburg game, but ultimately, and through the need to represent basic military realities, the Civil War design is a different creature to its sires. What are held in common are the overall aesthetic approach and the concept of dice-less combat resolution fed by fog of war. It is worth pausing here to consider what is actually meant in the context of these games by the matter of their aesthetic, especially in the physical sense. 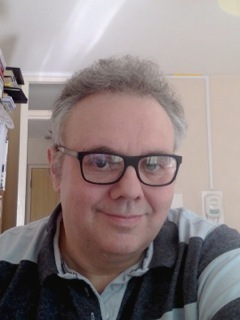 Naturally, all people connected to the hobby want their games to look good, but that is not quite what is meant with regard to the Simmons’ designs. Rather, if one looks at what Clash of Arms do with the likes of La Bataille or Age of Reason, where the likeness of the soldier’s garb is matched to a style of cartography symbolic of the period, we get a little nearer to what the Simmons aesthetic really means. One sees it also in the variably received (and designed) Eagles of the Empire series. Despite different companies taking the original concept in different directions, in essence this “series” was and is about portraying Napoleonic battles in a style that would recall the maps of David Chandler’s Campaigns of Napoleon, and provide both playing surfaces and unit rosters of manageable proportions. What then of Simmons’ approach? This could be described in various ways, but to my mind the map and blocks of all three games could be described as having the look of something you would find set up in some bygone commander’s tent on the eve of the decisive event. Alternatively, you could describe them as the three dimensional realization of a Nineteenth Century map of any of the given battles. In all three games, one side has red blocks (actually, thin rectangular wooden pieces) and the other, blue. 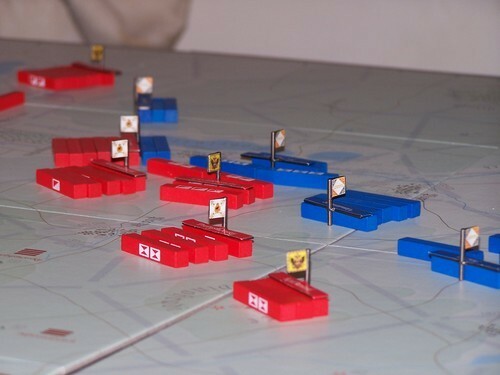 The military pieces of the two Napoleonic games are identical; but there is an important extra element in the Napoleon’s Triumph game in the shape of flagged leaders on metal stands. These are not “personality” leaders with ratings (or tempers), but administrative extras for that bigger battle, whose precise role we will look at a little later on. Just for now, it is worth adding that they do make their own contribution to the overall visual effect, which, putting the whole thing together, blocks, leaders and the map, has a certain restrained, minimalist beauty which subtly matches the way in which both this and the other designs play out. When it comes to the maps, and here I will confine comments for the time being to the Napoleonic games, I have heard different terms used to describe how the maps are portioned and defined, but “locales” is the official term. The maps of both games are mounted, NT having a linen effect finish, and each has a pale/mid- green background tint. The map for Austerlitz is big, but because the game does not use a supporting plethora of charts that also need to be close by and accommodated, the game, set up, should fit any reasonably sized table. For both Marengo and Austerlitz, the most important information on the map is found on the locale boundaries, and pertains to the effects of terrain for attacks into and out of any given area. One of the absolute fundamentals of playing these games proficiently is understanding what sort of force can make an effective attack or defence. It is, however, largely a matter of commonsense – do not send cavalry charging over rivers or into villages, and do not send substantial forces into areas full of subtle dead ends and inconvenient combat terrain. As for what you will be moving about, the blocks each show a basic military type, (infantry/cavalry/artillery), with the number of symbols (1 to 3) on the starting, deployed blocks, doing the twin job of showing strength, and, in certain degrees, quality – heavy cavalry is always a three symbol mounted unit, whilst Guard infantry is also a three symbol formation, but with a slightly different graphic to a standard three symbol infantry unit. Surplus blocks in the lower denominations are your loose change, to be used for step reduction during the course of play. Initial orders of battle can be described as abstract representations of quality and strength – you will not see any famous regiments or divisions, but overall, you will have your better forces as well as the average and nondescript. One area where the system can trip the novice player is with the representation of artillery. One symbol infantry or cavalry can represent militias, formations that have been shot to pieces, or, in the case of cavalry, screens and reconnaissance forces that, properly employed (i.e. not actually fighting) can bother the enemy by goading them into poor moves. Of course, one strength units of these types are seriously fragile, but it is another matter entirely with artillery forces – all of which are one symbol units, but when properly employed, are usually very bad news to attack unless you can gain a flanking position – again, more on that a little later. 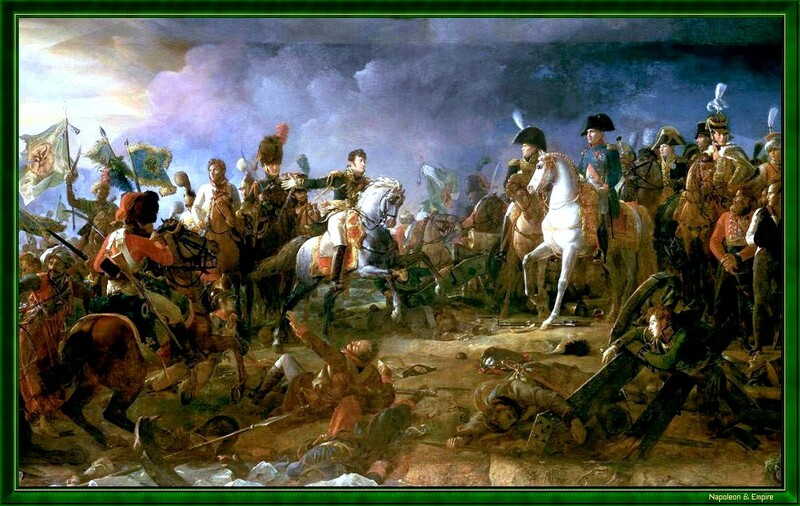 Apart from the difference in size of battle, Marengo and Austerlitz were battles of contrasting “pulse.” In the June 1800 battle, a lax and unprepared French army was taken by surprise and nearly overwhelmed by an Austrian force emerging from a bridgehead over the river Bormida. This is simply reflected by the French needing to qualify for activation before they can move. 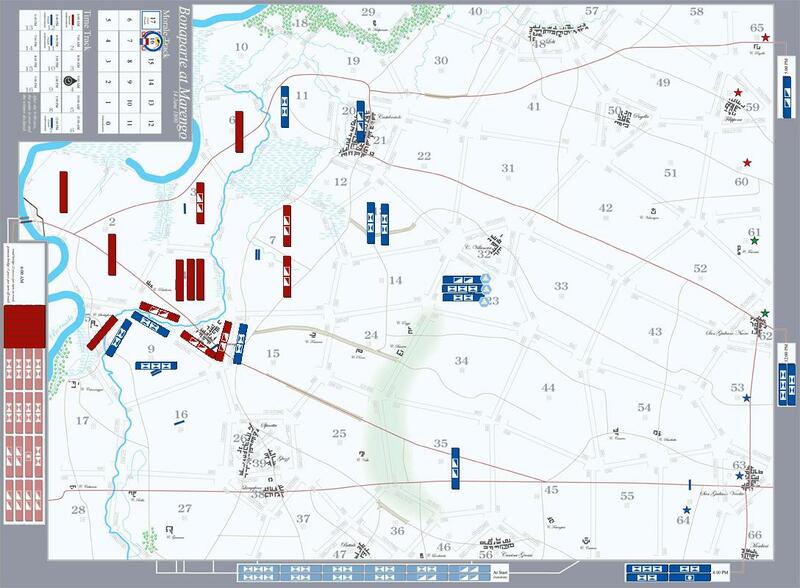 At Austerlitz both armies were ready for battle, but here the pronounced French tactical edge is reflected in a greater number of available corps commands (this is where the leaders come into play) and also in a greater capacity to issue individual commands to specific unit blocks. This, of course, brings us on to movement; but with combat very much integrated into movement actions (entirely so in the case of NT), there is a danger of this narrative becoming muddled if I try to interweave the whole process together. So, I will first look at “pure” movement actions, and then at the single most important design aspect of these two games – movement leading to combat. From the pure movement perspective, fundamental to the designs is that any one block, or group of blocks, can be in one of two positions within a locale – and each block must be in one or the other, not being able to switch position unless a movement command is issued or provocation by the enemy is responded to. 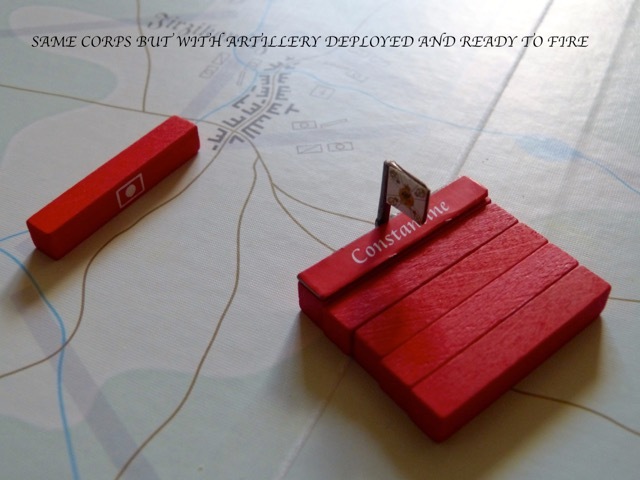 It would be well to relate this to an actual battlefield environment – blocks are either aligned in the centre of a locale, which denotes them as being in reserve, or they are deployed to one or more of its boundaries, for which the term used is “approach.” Blocks deployed in approaches are deemed to be in combat status for that particular facing, enjoying the benefits of any helpful terrain, and in the case of artillery, ready to fire. This is where attention to approach definitions is important, as it is no good putting types of unit where any negative effects on strength and mobility will fully play out. Furthermore, in the case of larger (longer) approaches, the associated locale can only be defended by a double frontage of suitable unit types – so marching into broad terrain with meager contingents and expecting to defend it successfully can be wishful thinking. I mentioned earlier that these games are not about the details of Napoleonic tactical evolutions. However, what they very neatly portray is the fuss and bother of trying to put a formation (multiple blocks in a locale) back together after it has been committed, at least in part, to manning the approaches. Only forces in the reserve have real movement flexibility, and if this is a corps (Napoleon’s Triumph) one order can get a lot done. On the other hand, being in the reserve position means exactly what it says – that those forces are in the best posture to do something else, but unless they do actually do something else, their combat effectiveness is noticeably reduced. This is more than just an administrative hiccup for the player; for getting enemy groupings to “go wrong” is a key aspect of good play. Not a few of the best wargame designs are based upon just one or two truths their originator wants to build a model around. In the case of these two Napoleonic games, one of those truths is that linear tactics of pounding frontal assaults will hardly ever work short term, and then may not work at all. When studying the details of combat, you will see that this is rather baked into the system. You can break a line by going through the front door, but it depends on either a slow process of degrading a force, or having absolute quality and numerical advantage when you first go in. In more common situations, successful combat is indeed a combination of disjointing the defending force in the chosen locale (or then going for some under-resourced neighbouring locale), and then putting your attack in via the perceived weak point. In fact, simply causing the enemy to break up a cohesive grouping into contingents trying to defend everything everywhere is a legitimate tactic irrespective of whether combat actually then occurs. Trying to put a force back together after it has been split apart takes time and more orders/commands than the player might want or be able to provide, and thus you are degrading the foe’s battle effectiveness even if their paper strengths remain unaffected. 1. Only in particular circumstances do you see the actual strengths and force-types of what is approaching you; the rest of the time, you see a number of blocks moving your way, but not what they actually represent. If you fail, without good reason, to commit to the approach at this point, subsequent actions may leave you regretting your temporizing. 2. Whilst it is not impossible to defend a locale from the reserve position, it is not ideal, as you forfeit both terrain and other benefits. 3. 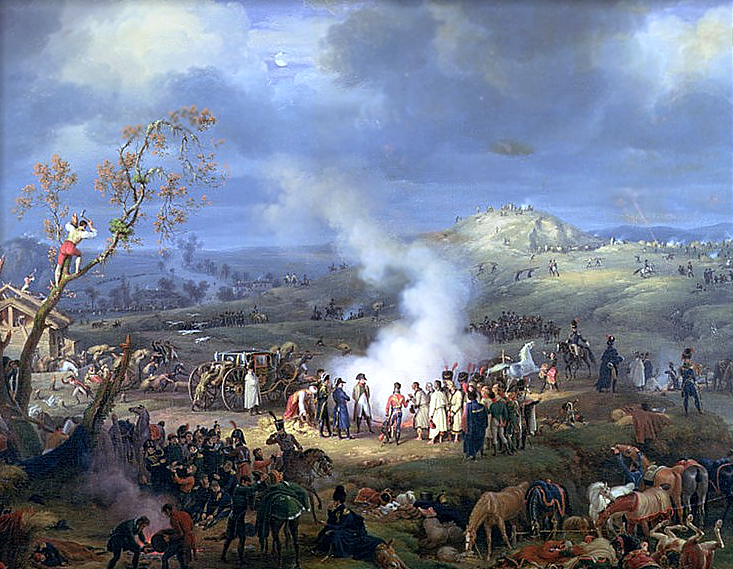 In Napoleon’s Triumph, attacks are initially directed at a locale via a declaration of a threat to that space, and if the receiving player dare not take the risk, they may well feel obliged to man the approaches at the cost of any cohesive reserve position. This, in turn, may be enough for the “attacking” player to feel job done, as this sequence is then followed by declaring any such threat to be a feint – i.e. nothing further happens. It does need to be affirmed, following the reference to Napoleon’s Triumph’s particular routines, that there are indeed some differences in combat procedures between BaM and NT; nevertheless, the essential precepts of combat in the two games do remain similar – disjoint positions, gain flanks if possible, and fold the enemy up. Learning one of the games after learning the other is not difficult, but I would not be alone among adherents of the overall system to say that what we find in NT is probably what Rachel was looking for originally in BaM and only just failing to find. 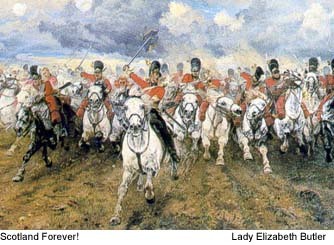 Incorporating the entire combat process into movement, including the feint, is part of this; and in addition to what else has been referred, there is the introduction of the counterattack procedure, which can have badly conceived and supported attacks fast unraveling as something like some wickedly concealed heavy cavalry comes thundering out of the smoke – just like the British Household and Union Brigades at Waterloo. And if this happens, the last thing you can do is blame it on bad dice, because, as I said much earlier, there are no dice – which brings us nicely on to how combat is processed in the two games. I do not intend to go through the entire process in detail, as this is well covered in Harvey Mossman’s excellent article, “A Real World Approach to Understanding the Attack Sequence” on TheBoardgamingLife.com as well as some rather good YouTube videos. I think it will suffice here to say that it has much to do with calculations as to the initial strength of the lead attacking and defending unit(s) – the plural pertaining to broad approaches – terrain, and counterattack. Casualties are not likely to be spectacular unless a very potent counterattack is launched, or, as stated above, a flank utterly caves in. All this can sound like so much abstract procedure bereft of a link to a sense of the hectic atmosphere of engagement and the battle’s furious struggle. But, in actual fact, there is far more battle here than might initially be assumed. These were battlefields utterly obscured by smoke – soldiers, right up to senior officers, saw some things sometimes, or did not; commanders tried to get their opposite number to do the wrong thing, showed one thing and then did another; supported cannon unlimbered at proximity to an enemy line and methodically demolished it whilst the hapless recipients of the carnage fell back on their shredded colours; some armies simply moved quicker than others; and some commanders could read others like a book. These matters you will find within the mechanisms of the games, along with other little touches that help define the appropriate role for the different arms on the battlefield. Are there weaknesses in the model? – yes, but they have a lot to do with how individual players handle gameplay and perceive what they have in front of them as an innovative design approach. One thing that has bothered me in observed play, is players performing individual moves that have “gamey” and “ahistorical” written right across them. I rather tend to the opinion that appreciating anything in life is a matter of understanding the nature of what it is you are looking at or in any other way experiencing. A £3 bottle of plonk will get you just as tipsy as a £75 claret, but hopefully you are partaking of the claret for something other than wanting to drink yourself under the table. Likewise, if you are listening to a great piece of classical music, or reading a great novel, it will help to know the contexts in which they were created, appreciate the effort that went into that creation, and so treat the whole exercise with a bit more respect – in other words, you do not approach Crime and Punishment like it’s a throwaway beach read. With regard to our wargame practices, we ought always to realize that the great titles are serious pieces of creative craft, over which designers and developers have sweated buckets – so ambling in and pushing the pieces around like you are playing something kept for the kids on a rainy day is not quite the form. Regrettably, the mechanisms of both games are open to such on-the-board eyesores as having bits a cavalry way behind the enemy’s front line for any reason except proper Napoleonic practice, but if you do play like that, just because you can, it is tantamount to guzzling down that vintage just because you got the cork out. One area where there might be a greater commonality of doubt is in how the designs represent the contingents of famous armies. It is not just that they are all on nameless pieces of wood, but that the forces are distributed and redistributed from one game set-up to the next. In both games, the initial forces have their reasonably accurate locations, but apart from a general force balance, what exactly goes where is very largely randomized. At Marengo forces are chosen from a shuffled pack – at Austerlitz, what any corps leader gets is up to the player, the only thing kept from the historical case being where each leader goes. If you are not fond of this, you might have a fit over the designer’s Gettysburg modeling. But as Gilbert Collins opined in his YouTube Guns of Gettysburg review, Gettysburg has been done so many times one could readily welcome a change – that something other than the same divisions at the same time on the same roads turn up…and then do the same thing. 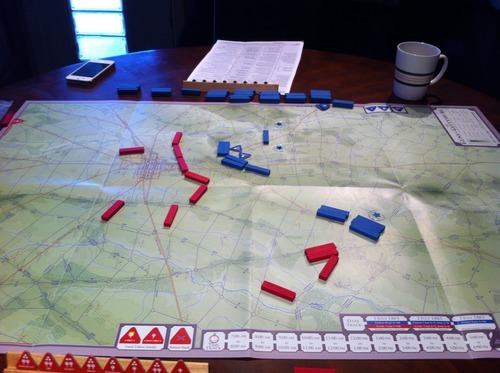 This new approach is simply the wargame version of giving the pot a good stir around – Lee and Meade’s armies are still where they were; the town is still Gettysburg, and it is always early morning July 1st 1863 when the battle wakes into life. What has changed is the simple supposition that some corps or some division was rather nearer or further back on a given road, or just shook itself into action that bit quicker. Nothing wrong with that, but not everyone is likely to agree. Speaking personally, the biggest challenge I found with Rachel’s work was simply trying to get my head around a fairly short set of rules allied to a design that did just about everything differently. The first Simmons game I got was Napoleon’s Triumph, and if truth be told, yes, I did find it a tad unsettling. There was next to nothing in anything I saw in the rules for which I had any resource of prior experience. But more than this, it was the sparse elegance of the thing – the box was seriously deep and certainly on the heavy side, but these supposed indicators of a “monster game” were utterly belied by the thin rulebook, the entire absence of charts, the incredibly quick set-up time and, of course, the frugal “look.” I was out of my comfort zone, but ready to acclimatize; not a few others, I rather suspect, would go hastening for assurance to the nearest counter sheet and hex grid map. There are many designs today (including many I like) that go seriously heavy on the markers – and we have all seen the photos. But if any wants to debate their absolute necessity to refine process and detail, do reflect on the Simmons approach, that functions without an on-map marker in sight through the course of the first two titles. 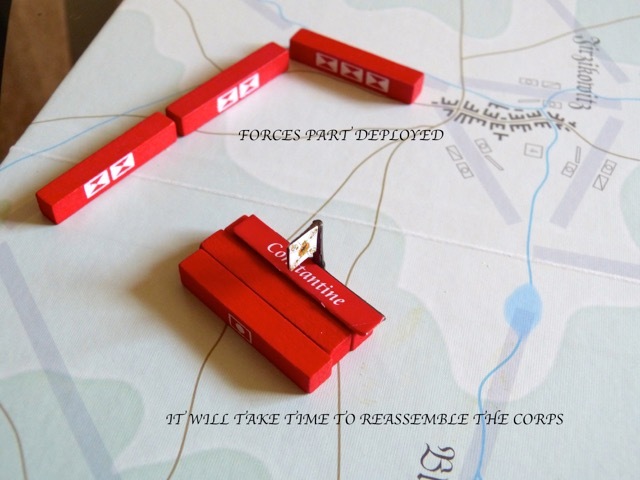 Despite this flagrant absence of cardboard, the processes in NaM and NT permit the expression of: Unit in Reserve/Unit in Defence/Attack Posture/Unit Under Corps Command/Unit in Independent Status/Unit in Routed and Disjointed Corps formation/Unit in Casualty Reduction/Unit in Road Column/Unit in Counter Attack Mode/Unlimbered Artillery. All of these modes have their place, their clarity of usage, within the Simmons model, and yet there is not a marker in sight for any of it – for it all depends on nothing but the simple positioning of the block, and thus the “look,” the aesthetic, is never diminished. Playing time for the two Napoleonic offerings probably evens out at between two to three hours of engaging experience. And the last special extra to mention is the facility with which the game can be taught to a novice. Getting to grips with the subtleties will demand effort, but acquainting a newbie with how to move and the gist of combat can be done in a few minutes – and there are precious few games you can say that about. And so to The Guns of Gettysburg, which finally appeared in 2012 after a considerable delay. I was certainly not alone in worrying about whether this much desired title would make it into print given the difficulties surrounding it, but before the project hit the rocks somewhat, I must admit to having been intrigued as to how the system I had got to know via BaM and NT would cope with the character of events in July 1863. I could not see the corps arrangements of NT working, given the way the armies arrived, piece by piece, and then how they took up position. 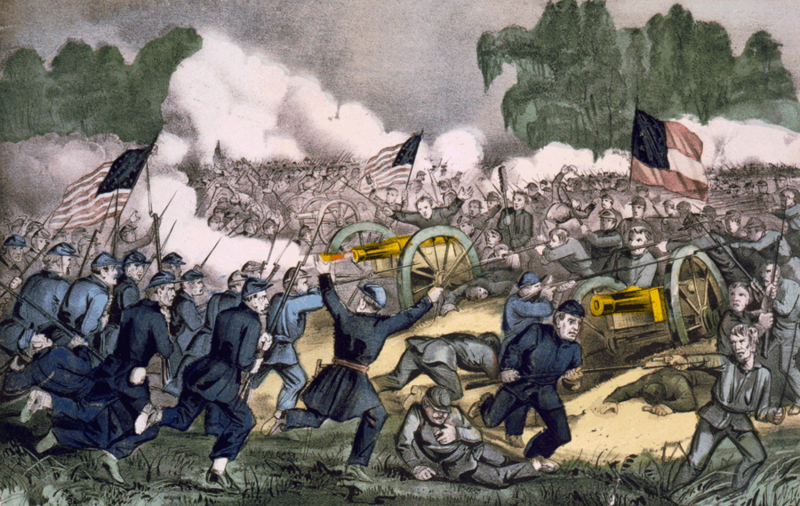 And what had worked for artillery at Marengo and Austerlitz, or for the close-up process of infantry engagement, was not going to be that feasible either – the extended ranges of most weapon types in 1863, and thoughts of that famous Confederate bombardment preceding Pickett’s Charge, just would not happen with anything like a similar take on the earlier games. The design logs Rachel was able to put together readily confirmed what I had suspected…at least in some regard. A whole new catalogue of procedures were being developed to cater to those later weapons and those very different armies; but what I had not expected was just how much extra “everything” would be worked into a game covering the potential three day battle. Nevertheless, when opening the box, if you know the previous games, TGoG’s parentage is pretty clear, even if the rules are telling a rather different story. To state the most obvious characteristics, the components are of very high quality, and certainly have that Simmons’ look about them. 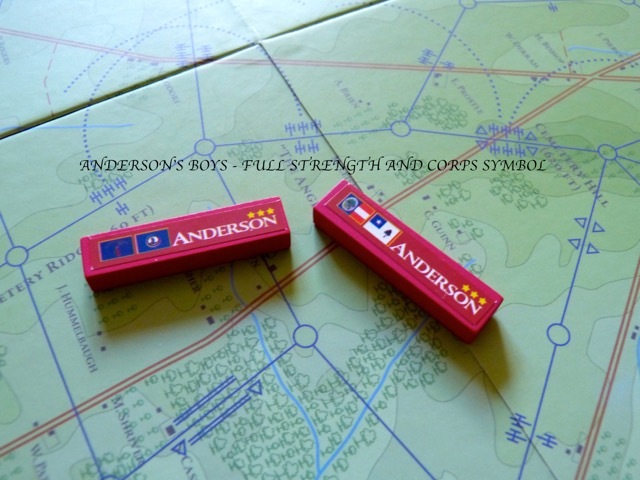 There are, however, a couple of issues worth mentioning – the red and blue blocks require stickers applied to them, which are attractive enough, with their representation of various state and national flags (these also serve as representations of strength), but mine, and not just mine, were not ideally cut around their corners, and as a result, some very small tags could result once the stickers were off their sheets. Of course, the game did come with spare stickers and blocks, which was just as well given that lining everything up on the very slim blocks was not easy. But that was minor stuff, to go alongside my very slight gruff with the map. This is very nicely mounted, and has certainly been very well designed and printed, but it is just that bit technical for my tastes. The Austerlitz map is a minimalist treasure depicting a few large hills, some frozen lakes and a scattering of villages. And apart from those discreet approach modifiers and locale capacity numbers, there is next to nothing else on it. By contrast, the Gettysburg map’s area boundary patterns extend rather mesh-like over the playing surface, and there are a lot of them. This may well be due to getting the map design in synch with the actions units can perform on it (those longer ranges again), but when added to artillery symbols, circles on the nodal junctions of areas, and other pieces of geometry for line of sight issues, steep slopes and obstructions, it is easily the busiest of the three maps and does not possess the appeal, at least for me, of the earlier works. And as I have probably said quite enough about wooden blocks and their associated maps for the time being, I will turn instead to all those component extras which, allied to their rules of employment, make this game a different creature to what went before it. 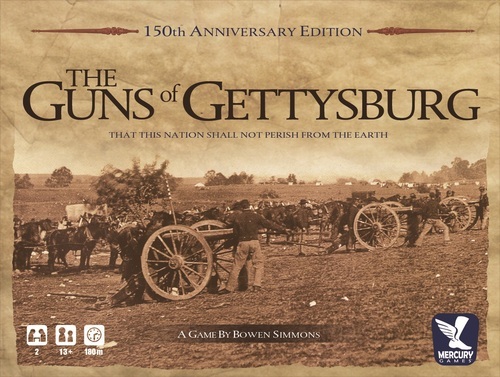 The designer’s notes for TGoG do not explicitly say if there was ever an intention to have this game as similar to NT as was suitable to a faithful battle study, but in the same notes Simmons states that early attempts to model Civil War elites after the earlier method did not provide a satisfactory effect, and so the hunt began for a new approach. 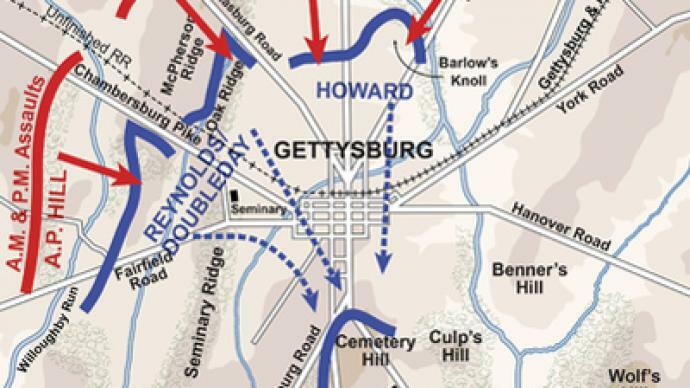 Having talked of a highly technical map, and with that, the deliberation that went into building a new, dice-less model, there is the apparently contrary fact that there is more randomization in the Gettysburg design than in any other of the three. It has its discrete forces and the “reaching” for the effective application of force in battle, but in the arrival of those forces, in the assets (artillery, field works) they have available to them, the length of any turn, and the shifting of objectives, there is actually more in flux here and uncertainty here than about the Pratzen or the fields west of Alessandria. One thing that does scream out from this particular game is the emphasis on artillery. Play BaM or NT, and your artillery will move, deploy, fire away at a position after it has unlimbered (moved into an approach), and generally pay its keep. But it is not, in either game, the deciding factor in winning ground and hurting the enemy with blazing damage. By contrast, with combat strengths for all Union and Confederate infantry blocks kept to either a 2 (full strength) or a 1 (a diminished strength that can be reached come the first hit, or somewhat later given a simple and very neat system for selecting casualty blocks), it is the supporting artillery tokens, (no artillery units are in either OOB), that will often prize open positions and ensure damage is delivered. I must admit to being a bit equivocal about this, as it seems a bit of a move on from how game artillery performs in the earlier period. In the Simmons Napoleonic games there is not some overbearing need to have artillery ever to hand, but you will want it close by and prepped for most Gettysburg situations. 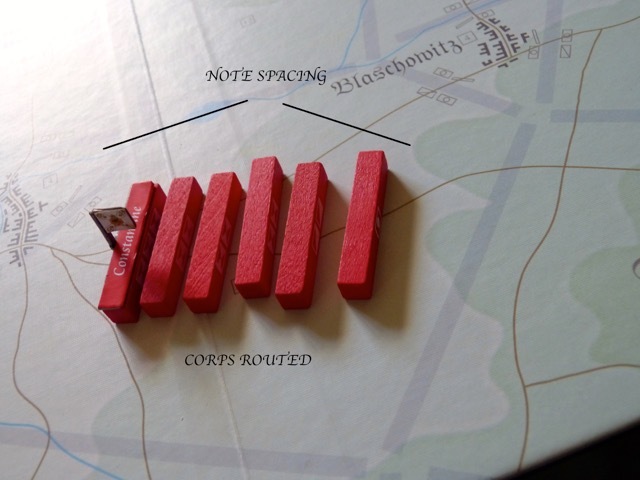 Having the right sort of tokens handy can be thought to express all sorts of historical realities, but it could also be seen as channeling gameplay into set paths for a set purpose – by this I mean that here we have Guns of Gettysburg way of doing things, but for a Shiloh or a Chickamauga, where artillery can hardly hold sway, another tweak or system would have to be produced. I will happily concede though, that I could be totally wrong on this issue, and it will be interesting to hear what others think. What I do feel certain of, is as with the other designs, any perceived idiosyncrasies are likely to bother not a few prospective players, and given that Gettysburg is by far the best known of the battles Rachel Simmons has covered, with its every historical moment known to many likely to lift the lid off the box, what the designer has omitted, changed, or generally reassessed as to its presence in the game, is inevitably going to cause a stir among at least some of its target audience. And allied to this, I have heard some comments from trusted parties that players have been wringing advantages out of the game by adopting tactics that have got nothing to do with the realities of The Army of the Potomac or The Army of Northern Virginia between and around the Emmitsburg and Taneytown roads. On such issues, people can make their own judgments. As for me, do I miss what is not present here, or is absent from any other of the games? For the most part, I can accept these design models for what they are – cerebral beauties for the right kind of player within that broad church of the hobby. 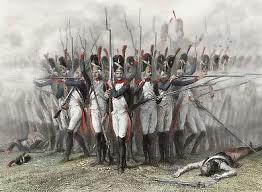 There is no sense of Napoleon in the earlier battles, but I rather sense he would have liked the games abundantly. 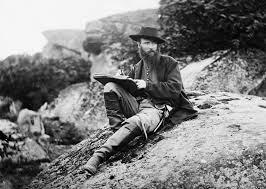 Likewise, there is no Lee at Gettysburg, but there is a serious situation that needs solving, and given the facility of swift play and tactile components, the reward, win or lose, is there to be had. One thing that has occurred to me, in the matter of what was included and what was left out, is the absence of a night recovery process for Gettysburg, whereby some strength returns as formations restore themselves with stragglers and the lightly wounded. Frankly, I do feel that is a bit of a miss. However, criticizing the game for gamey issues is not something I want to do, for the simple reason that in well over forty years of playing wargames, I have seen many a dubious advantage wrung out of near every legendary title the industry has produced – perhaps wooden blocks and unfamiliar systems exacerbate matters, but in the end the only solution is to find players who want the same thing from a wargame experience that you do. To conclude, all three games, are, in my opinion, totally valid takes on the battles they each present, but none are games to be endorsed and promoted by raucous slogans and exclamation marks. These are thinking games, rather than being all about overt blood and guts. If you are willing to enter their world with the right state of mind, you will be engaging with designs of the utmost flair and brilliance – not perfect, but that is often not the point of creative excellence. And I have thus far avoided comparisons with other games because I wanted to save that till the very last. There are systems for both eras which are capable of covering, without major overhauls, just about any battle from their respective times – Napoleonic Brigade Series, Eagles of the Empire, La Bataille, Civil War Brigade, Line of Fire etc. etc. However, I tend to doubt the same could be said of the Rachel Simmons designs for the eras they belong to – Waterloo done à la Napoleon’s Triumph; Spotsylvania as The Guns of Gettysburg? I am dubious; but then, I am also unwilling to countenance charges that these three games stray too far from their source material to be considered realistic, for there have been some seriously scripted designs in recent times, including Gettysburg recreated via Last Chance for Victory…and if you ever saw Enrico Viglino’s totally entertaining playthrough of that on his YouTube channel, you hardly need telling how it all turned out. Posted in Game Surveys and tagged Austerlitz, Civil war, Gettysburg, Marengo, Napoleon, Simmons. Bookmark the permalink. I found the multiple flash players rotating photos of the game to be so distracting I had a very hard time reading the text above and below them. Well written piece when I finally got past the flash players at the top. Superb article, which game would you recommend to best get a taste of Simmons designs? By the way, the site theme is terrible on a mobile device. I’m so sorry I missed your post and question. Anyway, to come straight to the point, I would really plump for Napoleon’s Triumph. It has real scope, will play fast once you have a handle on the system, and has not got that extra layer of mechanical complexity found in the Gettysburg game. I picked up Gettysburg, the systems are interesting, but a bit baroque to avoid dice. Rachel Simmons designed the three games? ?